Disneyland Parc, like the US parks, offers a wealth of entertainment. This varies somewhat year to year but you can count on a parade and fireworks. the 20th anniversary celebration train) and the main 3pm parade. Take note the main parade, much like Disneyland, runs from the north east to the south unlike Orlando. It circles the large hub and also Town Square affording maximum viewing. There are also two vast indoor theatres in Discoveryland and Adventureland, though the former has only hosted special events recently and the latter is seasonal. 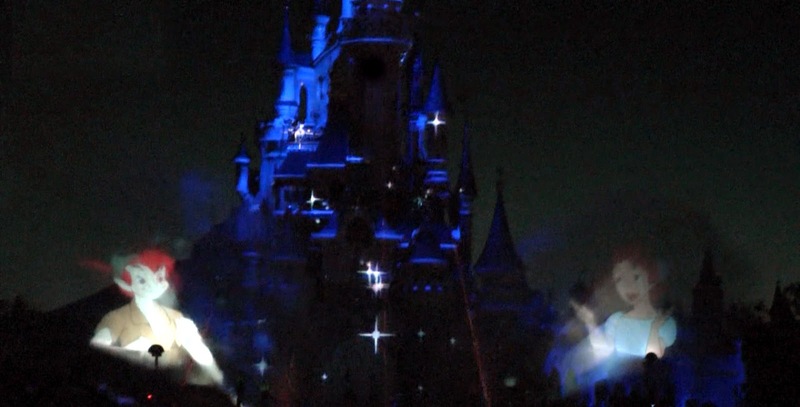 Fantillusion, a nighttime parade that took the best parts of Spectromagic and the MSEP, has been dark the last year and looks likely to be in 2014 too. 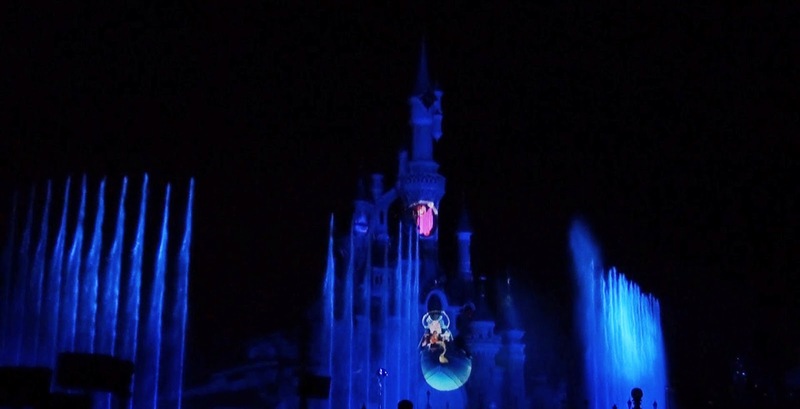 As well as cost, in the summer months it can still be light at 9pm+ and with its elaborate show stops there was not enough time to move it through the park before the main nighttime show. 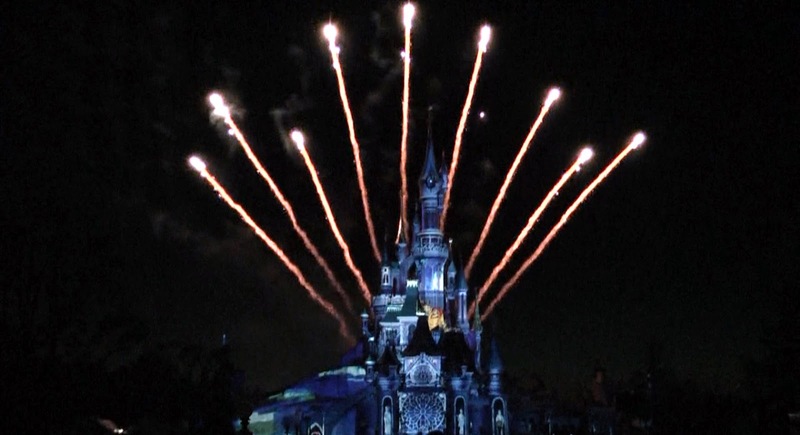 se looking for a huge, full on fireworks show like Wishes won't get one. Dreams! 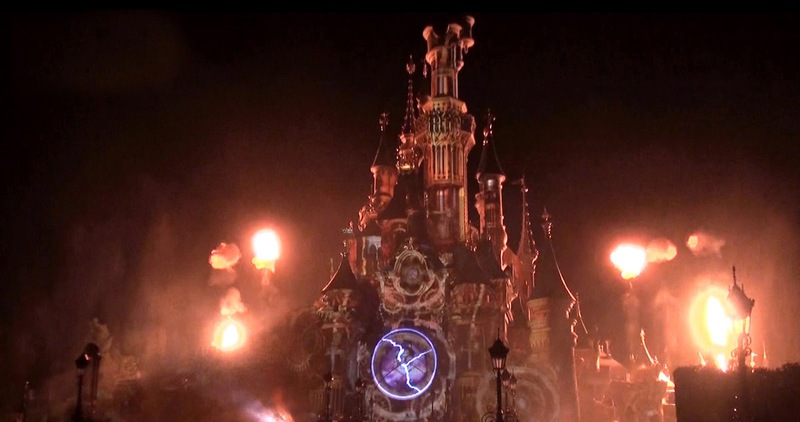 is a full on multimedia experience with pyro and fireworks, fire, projections, lasers, smoke, music, lighting and fountains. 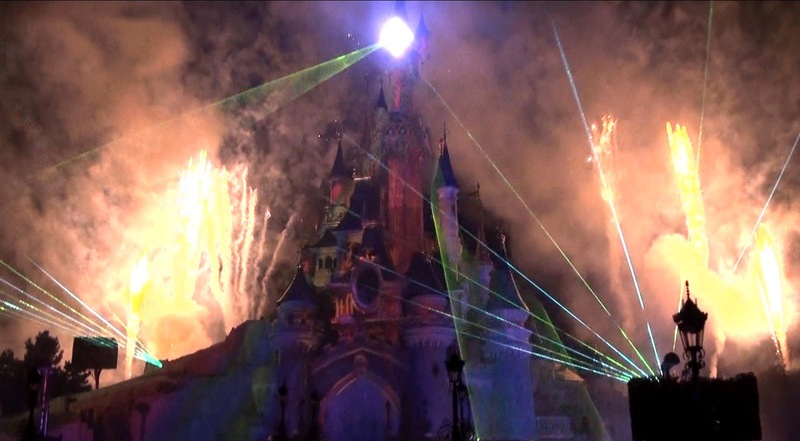 Take the best parts of Wishes or Magical, World of Color and Fantasmic! and you get the idea. Add in a good vs evil storyline featuring Peter Pan and his shadow, Wendy and Captain Hook and both good and bad characters and you have an epic show. Peters shadow escapes and releases magic from the castle for a tour of Disney Movies old and new, until evil escapes too. The show really is stunning and very very popular. Best views are afforded from the hub with the ensuing crowds. Snagging a place on the rope line may be a little damp and may need an hours personal space reservation beforehand but is so worth it. The Paris second gate. From a troubled start the park is now worth a day or more in its own right. This is partly still due to reduced hours, with the park rarely open beyond 6 or 7 PM even in high season. Hopefully as it expands more and this years E ticket pulls in more people the hours will extend too. Starting in the entrance plaza, ticket booths stand either side of the studio gate. Inside is an ornate area reminiscent of Hollywood studio cottages in the 30s and 40s. Passing a feature fountain leads to Studio 1. This is the parks Main Street, though inside. Cleverly lit and decorated it is part movie set part indoor street, with building facades clearly fake hiding shopping and fast food. The parks main source of merchandise is here, as is the largest fast food serving and seating area. Even so, at meal times it can be overwhelmed. The park needs to address this by ensuring the other (only one more) fast food facility is available when needed. There is also one table service restaurant in the park, though soon to be supplemented by a new one. More of this later. One thing the park does have is plenty of outdoor vending carts. And plenty of places for coffee! This is Europe afterall. Adjacent to the tram station is the Animation Building. This is part exhibit, part hands on showcasing the history of Disney animation. Again, good for first timers. Beyond here is the parks only spinner, themed to Aladdin, and three expanded areas that have pushed the parks boundaries and real estate much further out. Hard to miss is Crushes' Coaster. Part Seas with Nemo and part indoor spinning coaster, this was a much needed addition. Note there is no fast pass, though a single riders line is currently being added. And needed it is too, with lines regularly topping 90 minutes. Tip - get to the park half an hour before the posted opening. Often it opens early, and head right for Crush. Inside is a load area on the beach at sunset. A brief outside section leads to the dark ride portion, similar to Epcot. The main lift is inside a submarine, and a whoosh shoots you into the gravity building for a crazy, spinning ride though the EAC. Darklight props and projection effects add to the experience. Space Mountain in the dark. The spinning never seems to get too intense, and although some turns are very steep there are no inversions. Outside is a small flat ride area, which leads to another expanded area, Toy Story. Aesthetics aren't exactly brilliant but on a whole the area is well executed and added something for younger guests to enjoy. Three simple attractions fill the roster here, a flat spinner on Steroids, a pirate ship type ride within the arms (or the ship) and the Parachute Drop, an up and down hoist ride that's far tamer than Tower of Terror but offers some great views. All these attractions have limited capacity and so often develop long lines. The final expansion area opens this summer. Loving recreated French streets and architecture lead to Rattatouie, a multi million dollar indoor E Ticket. Think Winnie the Pooh in Tokyo, or Mystic Manor in Hong Kong, and add 3D glasses. This trackless ride shrinks you to the size of a rat for a chaotic journey based on the film. Adjacent is an attached large restaurant. This area is sure to draw the crowds when it opens. Backtracking towards the park entrance we arrive at Animagique. 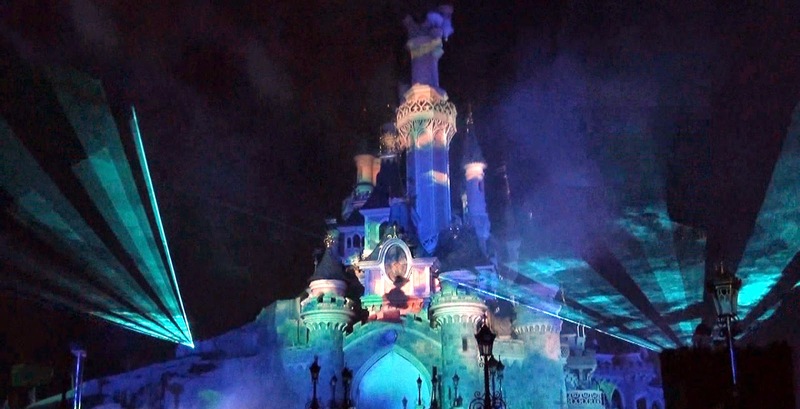 An indoor theatre stage show, part character show and park dark light show set to music. Very clever, and entertaining for the whole family. Shows run several times a day one after the other. Passing Studio 1 is Cinemagique, another indoor theatre tracing the history of movies and moviemaking. Part live action, part screen based, this is truly a great attraction where the boundary between film and live action blurs. Not to be missed, and again shows run consecutively. Moving further along is the original Walt Disney Television Studio. The original walking tour has now been changed for Stitch Live, similar to Turtle Talk with Crush. Walking further away the landscaping changes to hard steel architecture and Tarmac roads. This is the "production area" of the park. First up is the special effects show, Armageddon. Based on the film of the same name, a preshow gives away the secrets of visual and practical effects before guests experience them for real. Guests stand in a circular Russian space station, as it gets pelted by meteors. Clever, real effects including smoke, lighting, air and fire add to the experience. To create a hull breach, WDI actually built a room within a room. The show room is vacuum sealed at a higher air pressure than outside. When the hull is breached with a shower of sparks, the smoke (and air) in the room rushes out of the hole since it is under higher pressure. A very surreal experience. I won't give away the finale suffice to say things get very hot, dark and not everything stays still. Maybe one for the bigger kids only. Next door is Moteurs Action, the original version of the same vehicle stunt show cloned at DHS. Virtually identical live stunts but with different pacing are good to see once. Like elsewhere in both parks, narration is in English and French, cleverly scripted where one language asks a question and the other answers it whilst both languages say the same information. Finally we come to Rock n Rollercoaster. This is unofficially the sequel to the Florida version. The track layout, music and ride is identical but other things are very different. Aerosmith made it to the concert, this time the ride is in the venue. Instead of flying above Hollywood, this ride takes guests though the mother of all lighting rigs. Hundereds of multicoloured moving lights, strobes, stage lighting and smoke make the experience seem faster and more intense than Orlando. A recent LED lighting and smoke system upgrade for the whole ride only upped the experience. This was also one of the first Disney attractions offering different rides. Five different cars not only have different music, but the inride lighting is also synced to each car offering a visually unique journey for each train. Or limo. There you have it. WDSP is not the most detailed or immersive park Disney ever designed, and is the smallest, but it is coming of age, and is worthy of a day or two of your time. After your three or four days in Disneyland next door! Plus it will only get bigger. Special thanks to our Guest Blogger- Martin Smith.